The February calendar for LEGO is now available and February is the month that The LEGO Movie comes out. To further promote the movie, LEGO will be giving out a FREE exclusive LEGO Piece of Resistance Polybag (30280) for purchases of $50 or more. The offer will be available throughout the month, while supplies last. 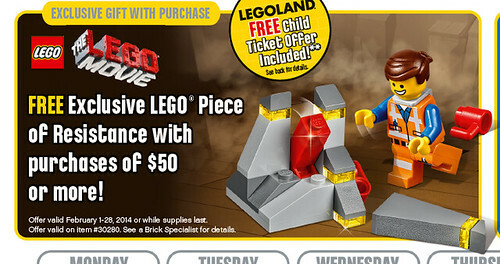 The polybag will consist of Emmet and the Piece of Resistance stuck between a slab of rock. The rocks looks very similar to the Thor and the Cosmic Cube Polybag (30163). 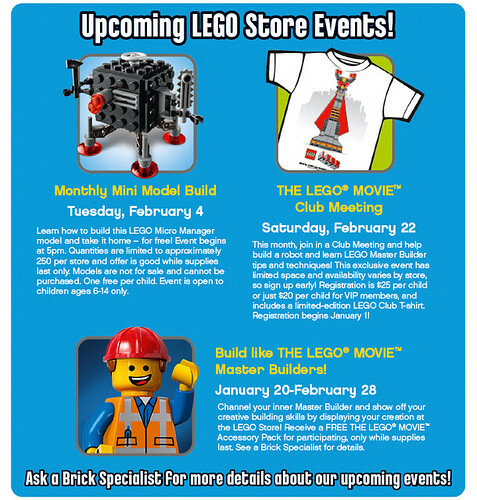 The other promo that LEGO will be having at LEGO Stores is the Monthly Mini Model Build. On Tuesday February 4th, you can build a Micro Manager model and take home. This version of the Micro Manager has four legs. Now you can add another one to your army of Micro Managers from all of the movie sets.